I design with passion. purpose. precision. My name is A. Lee and I work to give you the digital building blocks for your small to medium sized business. Below are some of the services I can provide. I can help bring your ideas to life with technical illustrations or stylized works of art. Work with me to create a unique and versetile website that fits your unique business. A matching newsletter is the perfect way to complement your website & keep in contact. Let me help you create a unique concept for your business that gives your brand a voice. We will work together to create a cohesive look and feel for your business, from logo design, to colors, fonts and marketing. Inquire below to learn more! Women of Email is a professional network female identifying group of email professionals ranging from marketers to developers aimed at promoting female leadership within the email community. Re-Design the Women of Email brand to better represent the Women of Email community. The goal was to combine their mascot, a goat, with the niche market of Email. 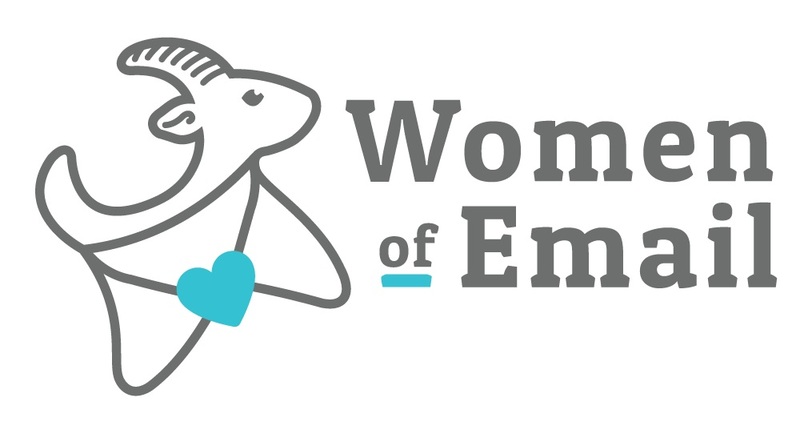 The identity for the Women of email is based on the visual representation of upward motion of email combined with the imagery of their mascot. I wanted to represent movement and the act of sending email with the goat. I chose thick bold lines that would easily represent small as well as large. The font is strong yet feminine and yet practical, representing both the simplicity of email and the feminine nature of the group. Reaching New Heights is a non profit organization built on the idea of creating a safe community and conversation between teens and police officers through rock climbing. To design a logo that combined the concept of police officers with rock climbing. I worked from Tara at Reaching New Heights to come up with a color palate that combined police blues with the natural elements that are inherent to the outdoors. The badge itself aims to provide a youthful and camp-like nature to the brand that can appeal to both outdoorsy adults and children. 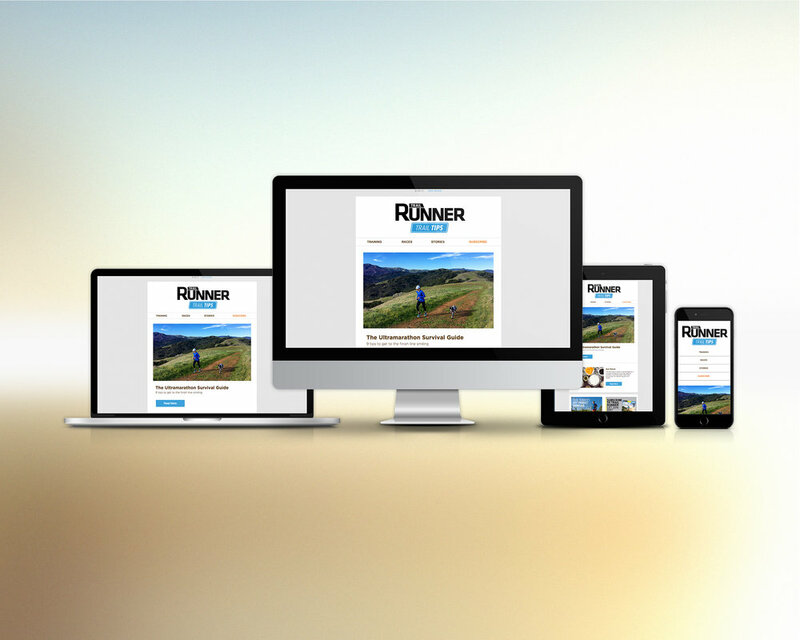 Trail Runner Magazine is the premier magazine for Trail Running around the world. 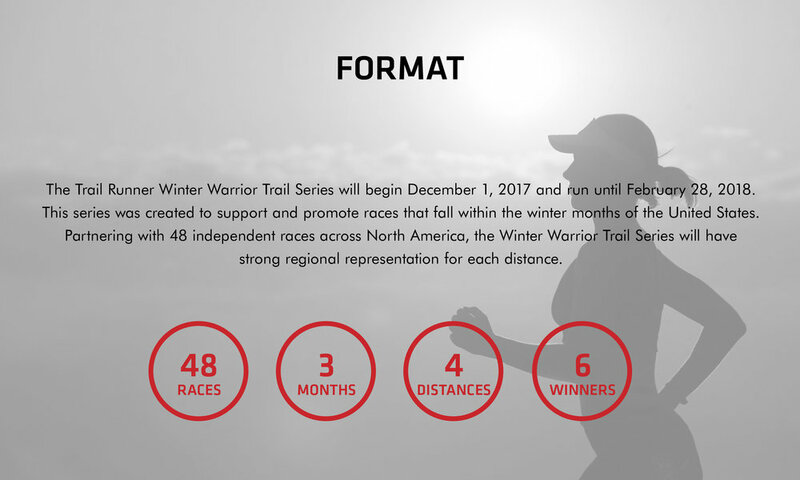 To design a badge logo for Trail Runner Magazine's Winter Warrior trail series. I wanted to help Trail Runner to create a logo that incorporated their established brand identity into a badge logo that represented the duality of winter running. I chose to use the established Trail Runner fonts that are both timeless and clear descriptors of the brand. Tiny Climbers is a passion project. Created by Rachel, an avid climber, Tiny Climbers is a company that creates a unique gift for climbers and their friends. 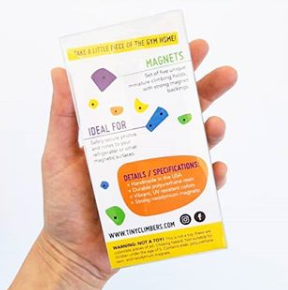 To create a logo that depicts the colorful and playful nature of these tiny climbing hold magnets. Fly Nutrition is a nutrition consultation business owned by runner extraordinary; Kylee Van Horn based in the Roaring Fork Valley. I wanted to combine wings and healthy fruit and vegetables into a brand mark in order to simulate motion and reflect the name "Fly Nutrition". I also chose to use bright colors pinks and greens in order to represent health and vibrancy. The Entrepreneurs and Investors Confluence is a yearly conference that showcases entrepreneurs in the Roaring Fork Valley. This unique Roaring Fork Valley based conference is an annual meeting of the minds in order to source funding for start ups. At the confluence, eight entrepreneurs pitched their businesses to investors sitting in the front row; Startup Colorado, Creator Colorado Venture Fund, Telluride Venture Accelerator and Four Points Funding. To create a simple logo that combined the letters E and I in a unique way. This conference is all about ideas and influencers coming to the Roaring Fork Valley. I took the letters E and I and combined the I into the classic lightbulb idea imagery. I wanted the logo to have a professional and modern look but also incorporated the warmth and glow of ideas and growth. 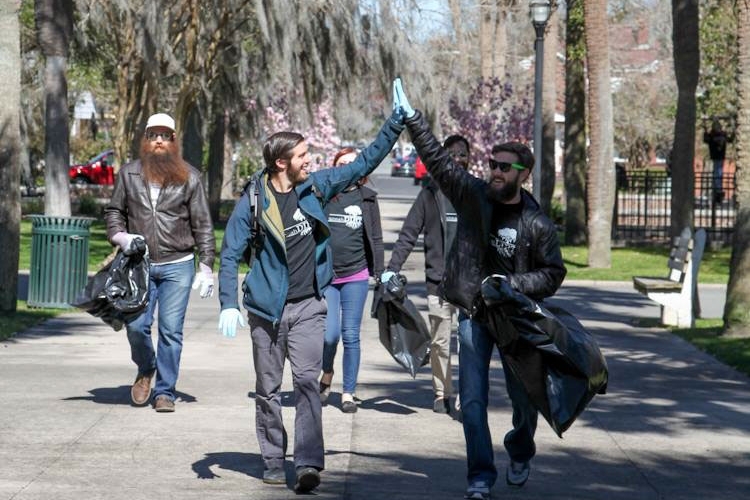 Savannah Dirt is a grassroots organization that believes through sustainability and community, we can make Savannah Georgia a vibrant, clean and verdant living space. To create a brand identity that incorporated Savannah’s iconic live oak with a grassroots feel. I created a logo that separated the tree from the roots by the words “Savannah Dirt” to show how there’s something that makes up the foundation of the beauty of Savannah. They type treatment I chose was a organic looking slab serif in order to represent the natural elements of the cause. The owners wanted this to be a national movement where Savannah could be replaced with any city. Rock and Ice magazine is a world renowned climbing magazine that showcases the best climbing photography and writing. To design a badge logo for Rock and Ice's gear section of the magazine. It was made to mark gear that has been reviewed by the Rock & Ice team for either 100 pitches or 100 days. The Editor and Chief wanted to create a simple badge logo with a gear symbol that represented the tough nature of the gear. I took a bold font and coupled it with a grunge texture to provide a rough and tumble identity. Rock & Ice Magazine is the premiere climbing magazine created by climbers, for climbers. Trail Runner magazine is the only source for trail running tips, news and training information. The Weekend Whipper is an email campaign in which Rock and Ice magazine finds the gnarliest, most terrifying 'whippers' or falls in the climbing world. I created this graphic for use on web banners, in print and for any and all advertising. I wanted to create something that simulated the situation of falling and fear so I put the viewer of the logo in the shoes of the person taking the ‘whip’. This logo and banner is aimed to catch the attention of people scrolling through the Rock and Ice website. The Savannah Climbing Co-op was created to promote climbing and community in the city of Savannah, Georgia. This climbing gym is a meeting ground for passionate climbers hoping to find a shared love of this unique sport. Branding the Co-op with a logo that represented the climbing community. I worked in different pieces of climbing gear in order to create the letters of the abbreviated ‘Coop’. The goal was to create a logo that embodies the goofy climbing community that exists in Savannah. 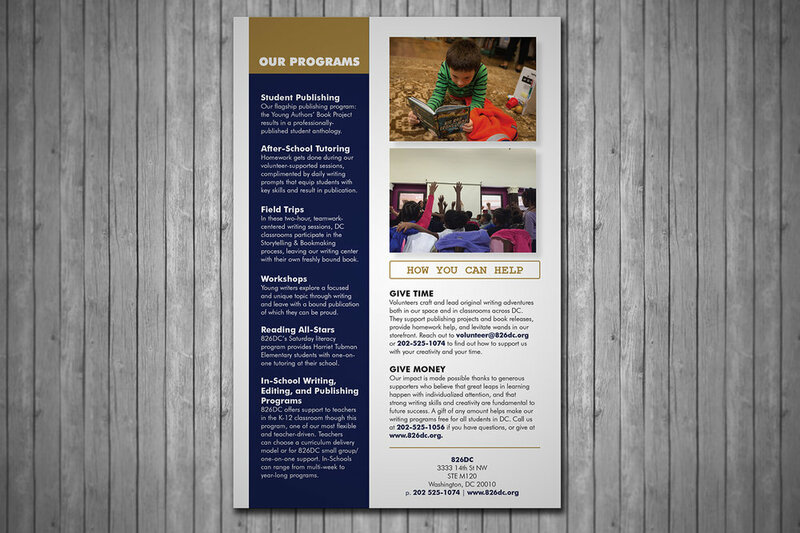 In my time at the non-profit organization 826DC I created several different posters for events, print and web sell sheets and invitations before and after their branding re-design. This is a collection of work I created for both the current previous identity of 826DC, a non-profit organization that supports grade school children with their reading and writing skills, and promotes the idea that one on one attention and a strong foundation in writing are fundamental to success. Need a website? Let's make that happen. From content managers like Wix and Squarespace to code from scratch, I've got a option to fit your budget! I was privileged to be involved in the re-design of the Rock and Ice webpage including the UI/UX and design. They wanted to organize a chaotic home page and create a visual hierarchy that helped the viewer find what they are looking for. Using the bold and timeless look of Rock and Ice Magazine, I created bold splash pages and a classic look for Rock and Ice’s My Epic. The goal was to create a seamless look that incorporated Rock and Ice’s sharp imagery and clean typefaces with advertising from Outdoor Research. These product showcases were created to promote individual products and events at both magazines. This is a mock up for the Cafe Gelatohh!!! Formerly located in City Market in Downtown Savannah, GA.
One of the best ways to maintain your clientle is to send a consistent email newsletter. This tool is a great way to keep in contact with the people you want to reach. I was able to design and code the new design for Trail Runner Magazine's weekly email newsletters, Inside Dirt and Trail Tips. When working at Rock and Ice Magazine, I've created specialized emails for our advertisers. Do you have an idea that you'd like to see on the page (or computer?) I can help your idea come to life through stylized or technical illustrations. Illustrations created for the t-shirt and poster for Rifle Rendez-Spew 2018, a climbers festival put on to support the Rifle Climbers Coalition.